Plant names One of the first problems you may encounter when searching for a plant or mapping a plant is that in the world of botany scientific, or latin, names are used exclusively. To assist the non-professional users of the Plant Atlas, a name finding tool is included. The Name Finder page can be found on the Database Search drop-down menu. 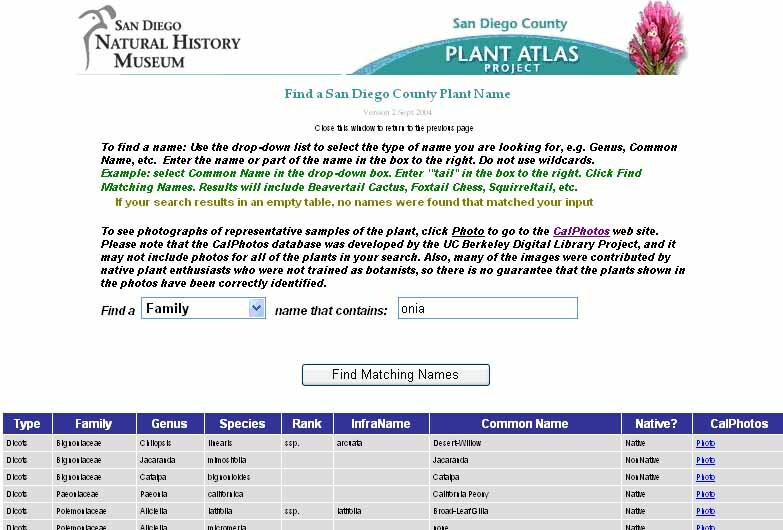 You can use the name finder to find the scientific name of a plant by entering all or any part of the common name. For example, if you wanted to find a plant whose common name included the term "mallow", the name finder will produce plants including Chaparral Bushmallow (Malacothamnus fasciculatus), Thick-Leaf Desert Mallow (Sphaeralcea ambigua var. rugosa), and 16 others. Each plant name listing includes a link to a Google® image search for a photo of the plant. 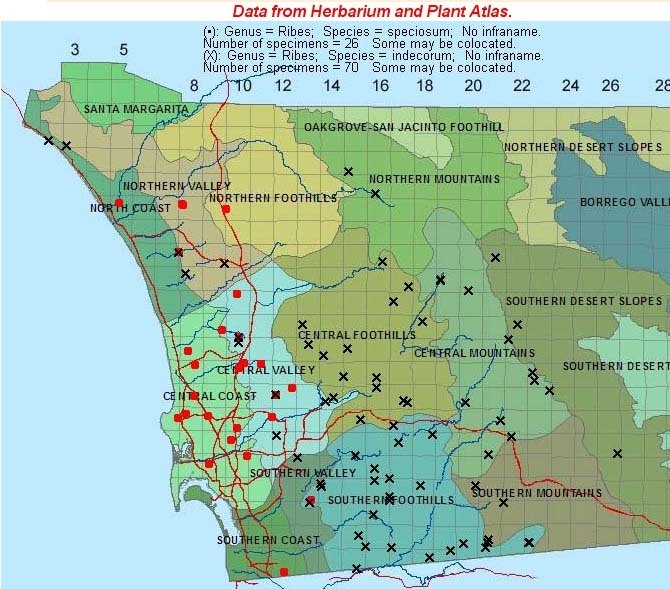 General Search of the database The herbarium of the San Diego Natural History Museum contains nearly 80,000 collected specimens from San Diego County, all databased and all georeferenced. Some specimens date back to the 1800's, and with the Plant Atlas currently active, the collection continues to grow. 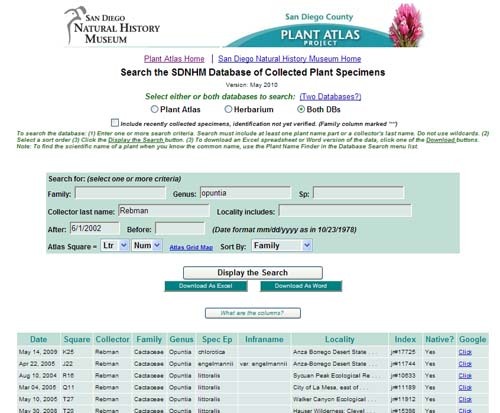 Searches of the database can be done by plant name, collector, dates and date intervals, locality names, and Atlas Squares. Any or all of the search criteria may be used for a search. the results of the search can be viewed on the screen or downloaded to an Excel table or Word document. The Atlas Grid of the Plant Atlas is a grid based on the Township and Range survey, and used to assign collection areas to volunteer collectors. The grid consists of nearly 500 3-mile square segments; a link on the search page opens a view of the grid for reference purposes. You will find the database search page at the Search the Database link under the Database Search drop-down menu. that you draw yourself on a map. The base map is a Microsoft Bing Map that can be moved and zoomed as required. You can draw a rectangle anywhere on the map and click a button to get a complete list of the collection within that rectangle. The list appears in a box on the page and can be copied to a document. In the example to the left, the user has drawn a rectangle containing the Ramona area. The allowable size of the rectangle is restricted to limit the number of results. The user gets a message on the screen if the rectangle is too large. You will find map rectangle search page at the Search a Map Rectangle link under the Database Search drop-down menu. Search Within a Map Polygon If you want to work a bit harder, and draw a detailed polygon on the map rather than a simple rectangle, you can choose to do that with the Search a Map Polygon tool. You use the same Bing Map that can be moved and zoomed as required, drawing a polygon anywhere on the map and clicking a button to get a complete list of the collection within that polygon. The list appears in a box on the page and can be copied to a document. The polygon can be as complicated as you please with no limit to the number of points. In the example on the right, a user has drawn a polygon to encompass the area to the west of Anza Borrego State Park, between it and the Cleveland National Forest. You will find map rectangle search page at the Search a Map Polygon link under the Database Search drop-down menu. Customized Map Searches Customized map searches off the full power of GIS, providing a true spatial search of the Botany database and allowing users to create and save their own custom shapes. Users can search within a shape, or search within any distance from a shape. They can search within a radius of any point, or any distance from a line, a single line or a multi-part line such as a river. And a user can create and store a shape for current and future use. This powerful searching capability is offered only to current Parabotanists who have a valid login. The page is accessed from the Geographic Searching link under the Database Search drop-down menu. Users will first encounter a log-in page which requires their Parabotanist credentials. The Search Page offers a text entry box into which the user enters a genus or a series of genera separated by commas, that will be the subject of the search. Note: These searches are not limited by area, so they are restricted to individual genera to limit the number of results. The user then enters a distance for the limits of the search around the shape, line, or point. Then either a shape, line, point, or Atlas Square is selected as the focus of the search. If selecting a polygon shape, the user selects from a drop-down list that includes a number of preprogrammed shapes and whatever shapes the particular user has stored. Stored shapes are private to the individual user. The Draw/Save page is used to draw shapes and save them as named shapes or lines that will be available to the user. Special options are available on request. Users can, if they wish, ask the Botany Department to make any shape they developed into a publicly available shape. Users can also provide ESRI shape files that we will include in the saved shapes either for that user or all users. Users can request customized searches using their shapes and search criteria not available on the web search page. Quick Distribution Maps For users who want to see the distribution of any collected plant, this tool provides that in a fast, simple map. Two species can be mapped together as shown in the example. 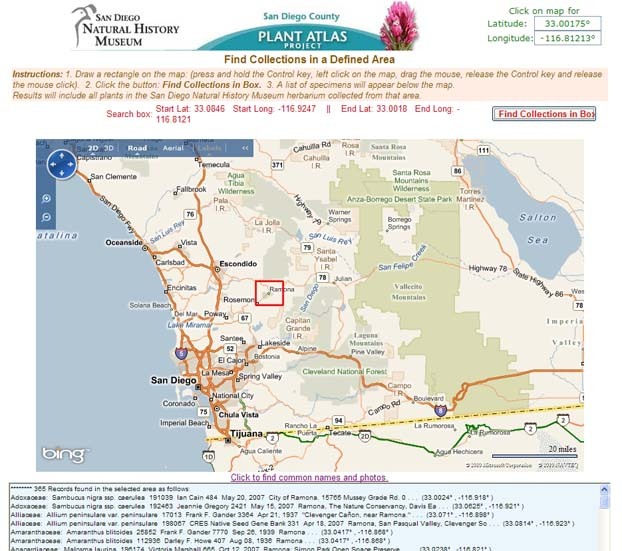 Plant distributions can be shown on any of five selectable maps: a general county map with roads and terrain, a vegetation-type map, a topographical map, an Atlas Grid map, and an ecological regions map. Users can also choose to map specimens from either or both of the botanical databases. The page is accessed from the Qucik Distribution Mapping link under the Mapping drop-down menu. internal capacity. As each species is mapped, the listed data is displayed in a box at the bottom of the page, and a set of icons for the specimen locations is displayed on the map. You can turn on the Atlas Grid for reference. You can resize the map if your screen is capable of a larger display. You can click anywhere on the map to show the latitude and longitude of the point on which you clicked. The page is accessed from the Plant Species on Google Maps link under the Mapping drop-down menu. Some users prefer to use the Berkeley Mapper, another Google Maps-based species mapper. The Berkeley Mapper is a service provided by UC Berkeley and is also found on the drop-down menu. To see the complete distribution of any particular genus, use the Genus Distribution Map feature. Plant Atlas on Google Earth If you use Google Earth, you can download the complete Plant Atlas database as a Google Earth "place". Note that Google Earth is a demanding program, and coupled with 70,000 or so of our data points, it can act strangely at times. Google Earth may not perform well with these overlays on older, slower, computers.